"This is a great way to use bananas that are too ripe to eat on their own. Serve with candied pecans or walnuts and real maple syrup." Preheat a waffle iron according to manufacturer's instructions. Grease the inside of the waffle iron. Mix all-purpose flour, whole wheat flour, baking powder, and salt together in a bowl. Whisk milk, bananas, canola oil, eggs, and vanilla extract together in a separate bowl; stir into flour mixture until batter is moistened with a few lumps. Spoon about 1/4 cup batter into preheated waffle iron and cook according to manufacturer's instructions. 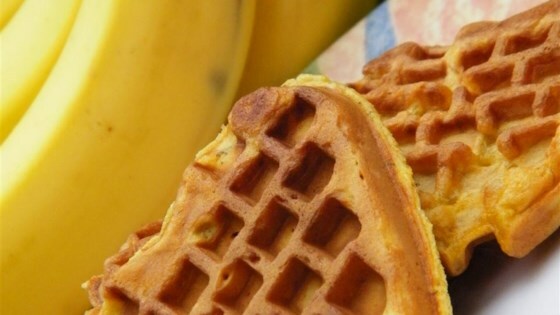 Make delicious waffles with bananas cooked inside the batter. These waffles did not make good belgian waffles.i had to cook them till they were very dark just to have the middle cooked through. I made them as written and they are delicious! Nice and crisp with a great banana flavor that isn’t overpowering.